A prayer for The Won's Supreme Court appt. O Dark Gods of Politics, Thou who Dwell under Rocks, please visit upon them that which Thou so cruelly visited upon Bush the Elder, when he who was called Sununu pronounced the appointment of a stay-at-home momma’s boy sheep farmer a “home run,” and Thou made of him a Flaming Lib. I know this is asking a lot, O Vile Lords of Contrariness, Stupidity, Corruption, Vice, Narrow Self-Interest and Betrayal, Wretched be Thy Names, for Thou hath ordained of late that door shall swing mainly in the other direction. Find for him, Thy Anointed Won, a lefty handwringer who legislates most stridently from the bench, a champion of absurdity, let us see this scoundrel exalted, and then dispatch the Winged Monkey of Thy Perversity to throw his Righteous Wrench into those works! This is my earnest prayer, O Frightful Ones, who have so capriciously visited wide stances, no WMD, and the likes of Specter and Powell upon us, lo, these many years! I almost (almost!) dropped The Coffee Bowl at "Winged Monkey of Thy Perversity"! Hilarious. Though some of my more skeptical brothers seriously doubt this, this blog would exist if no one ever even looked at the WISH LIST. That readers not only look at the list but also purchase books and send them to me is Pure Gravy. I am consistently amazed at the generosity of the God's People! There is almost nothing more useful to a Dominican preacher/student/professor than a good book. . .especially when EU book prices are sometimes double what they are in the U.S. Factor in the exchange rate. . .well, you can do the math. I've also received offers of financial help and technical assistance with a new laptop when my trusty DELL needs replacing. . .offers of assistance in getting back to the U.S. in this summer. . .offers for home-cooked meals and an evening's visit. . .even an offer to help me with my luggage and a ride home when I make it back! So, once again, I am granted the opportunity to express my thanks to God and His people for His generosity and the resulting generosity of those who find something useful in my little blog-ministry. Daily, I receive assurances of prayer and fasting for my personal intentions and the health of my family back in the boonies of Mississippi. There's no expressing my gratitude for this. I can only admit to being awed by the movement our Lord's Spirit among His people. Despite my all-too-frequent lapses into crankiness, I live in hope, trusting fully in the promises of God that Christ's victory over darkness and despair is complete. As we move inexorably into more and deeper conflicts with the powers of this world, we must keep squarely in front of us the sure knowledge that the battle is won. The race is over. Laying claim to this victory and then behaving accordingly is not only the key to our survival but our baptismal duty. . .and I daresay, our privilege. So, a thousand Thank You's to HancAquam readers, Book Benefactors, commenters, fellow-cranks, and lurkers. We got nothing to lose b/c the battle is won! The book manuscript is slowly approaching its First Draft Form. . .almost ready to be sent to my lovely editor, Deb, at Liguori! Isn't "skeptical Christian" an oxymoron? Why do we put-up with Catholic-bashing? I need a new desk chair! The coming zombie apocalypse: biblical proof! Toldjah it was a religion. . .His Immenseness Pope Gore I must be so proud. Why does this sort of thing drive me nuts? OK. . .my day doesn't seem quite so bad now. After I get a new laptop, I'm gonna get one of these. I have enough trouble with the alphabet we use now! Drudge is reporting that the Air Force One joyride over Manhattan--the one that Obama knew N.O.T.H.I.N.G. about--costs us $328, 825. I suppose we should be thankful. The Abortionist-in-Chief could have sent those taxpayer dollars to Mexico and paid for 1,096 abortions (assuming that Moloch charges the going rate in the US south of the border: $300 each). So, the "publicity stunt" over Lady Liberty quite possibly saved the lives of almost 1,200 kids. Ah, Hope and Change. . .Change and Hope. "The idea of the piece, or the reaction that I'd hoped for, was to highlight our nation's deep partisan divide and how our interpretation of the truth is really prejudiced by our political perspective and I think that to a large degree we are being manipulated by the media. I miss the old day when we just have the facts. Now we have pundits and spin and strategists. I just thought that through that painting people would see different things. The right and the left would have different interpretations of it based on their political lens. But I have to admit I was very surprised that instead of that I got thousands of email complaining on the religious front. And that was not my intent at all. I wanted to create a dialog politically but not religiously. I didn't mean to make fun of anybody's religion; maybe I did so naively but I didn't mean it that way. 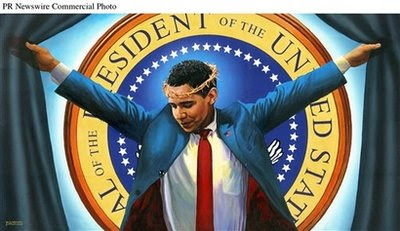 In the bible Jesus is The Truth and comparing Obama that way isn't something I meant to do at all. Apparently, I've upset a lot of people. And I've decided that's not what I wanted to do and I'm not going to display it in the park on Wednesday ... art is meant to be somewhat provocative but the religious element went way farther than I had anticipated." OK. . .first, I'm very glad that people let this guy know what they thought about his painting. Second, though I am willing to give him the benefit of the doubt, I find it extraordinarily difficult to believe that he didn't know what he was doing when he chose the crucifixion as his model. Third, I am amazed at his thoughtful response to the public's criticism. Normally, artists long for the sort of public ridicule that this sort of painting receives. Great for publicity. Great for the artist's self-delusion that they are "cutting-edge." Great for raising one's creds in the art world as a self-anointed martyr. 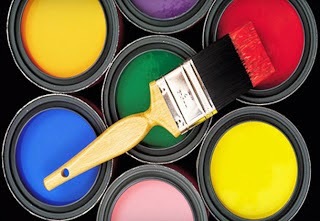 Question: should he have withdrawn the painting from exhibition? I'm not a conspiracy theorist but. . .
Now. . .if I were one of those tinfoil-hat-wearing-New World Order-ruled-by-alien-reptiles conspiracy types, I would be foaming at the mouth right now. . .
Test run for the next 9/11: just making sure! Scaring up some pretext for martial law? Run it up the flagpole and see who genuflects. . .or doesn't. Laying the groundwork for an anti-Church? No worries! He's coming. . .to take care of us all. I'm not a conspiracy theorist. Nor do I believe that This is the End of the World as We Know It. What I do find fascinating is the sharp uptick in stories and commentaries that use apocalyptic language and images to convey basic political disagreements. Both the Left and the Right indulge in this sort of hyperbolic rhetoric. Perhaps this is a remnant of our evangelical Protestant history. Perhaps it just makes good reading on the internet. Or perhaps I'm an unwilling dupe of our Reptilian Overlords and vehement denial by seemingly rational, well-educated people is all part of the conspiracy! That bacon you smell frying is Fr. Jenkins of Notre Dame fame. 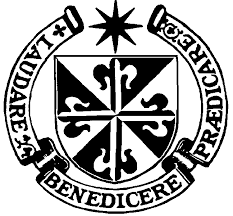 . .
Just announced: Mary Ann Glendon has declined the Laetare Medal awarded to her by the university and has said that she will not attend this year's graduation honoring our Abortionist-in-Chief, the Obamessiah. The letter is posted at First Things. Demand on the site is causing a slow download, so be patient. The most telling element of this letter is Prof. Glendon's assertion that she is declining the medal and the invitation b/c Jenkins used her attendance in his "talking points" to cloud the issue of The One's invitation with a thin veneer of "balance." She also spanks him for ignoring the USCCB's guidelines on not inviting and honoring pro-abortion speakers on Catholic campuses. Nah. Not scary at all. Not even a little bit. What's the big deal? As I scurried around my room looking for a prayer book this morning, it occurred to me that I haven't begged for books in a while. . .not very mendicant of me. So, I got out my "Books I've Read About But Not Yet Read and Need To List" and updated the WISH LIST! I've focused on books that will I will use when I start teaching here in the fall (God willing. . .). I recently rec'd two books (authors Pannenberg & Staniloae) that will be acknowledged with a Thank You card tomorrow morning. Please keep up the prayers as I finish the manuscript for my own prayer book (linked to the right). So far, everything is right on schedule. As alway, mille grazie. . .grazie mille! P.S. And yes, I will be getting back to weekly homilies once the manuscript is done. 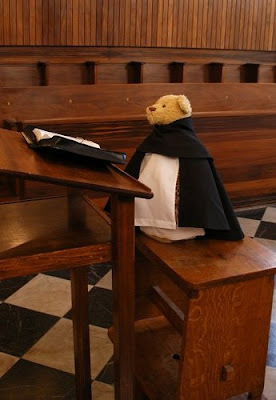 A Dominican bear in Rome! This will be me if I don't cut my hair and trim my beard very, very soon!